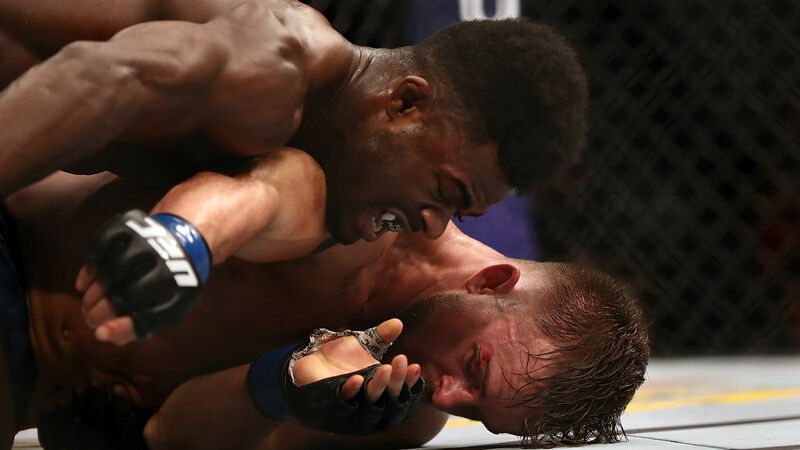 After seeing a possible “Knockout of the Year” by Geoff Neal in the last fight of UFC 228 against Frank Camaacho, Aljamain Sterling decided to try and one up his one counterpart, defeating Cody Stamann by second round submission with a kneebar. The first round saw Sterling and Stamann going back-and-forth with neither taking a back seat. The second round featured Sterling pulling away and Stamann becoming desperate. Stamann took Sterling down, but “The Funkmaster” quickly reversed position and was able to take Stamann’s back and started raining down shots. Then, in one of the best transitions you will ever see, Sterling had Stamann in a full nelson and quickly went to a kneebar and twisted Stamann’s leg like a pretzel. Stamann tapped out instantly. The victory snapped Stamann’s 10-fight winning streak. It was Sterling’s first stoppage since 2015 and he is now 16-3 and now has reinserted himself into the conversation at 135 pounds. Sterling lost back-to-back fights and has won four of his last fights.